Readers embark on a glorious day accompanying Lulu. She introduces us to her family, house, garden, toys, friends and favourite activities as we turn the pages and lift the flaps in this bright and bold picture book for the very young. 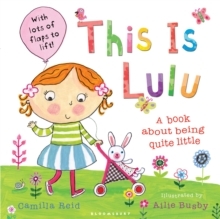 Packed full of familiar activities and objects, this exciting identification book, with a story in the vein of bestseller Richard Scarry, will be welcomed by all whether they’re already Lulu fans or are new readers.